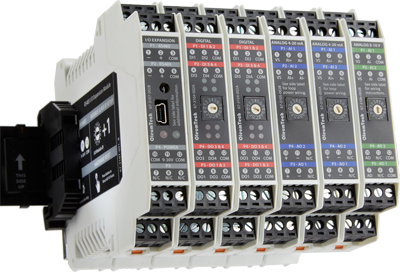 The OleumTech® Modular I/O Expansion System enables you to instantly add I/O capabilities to any Modbus master device using serial RS485 connectivity. The RS485 I/O Expansion System does not require any software or programming, making it one the of the easiest and quickest local I/O expansion solutions available. Constructing an I/O Expansion System begins with a RS485 Power Module, which is available as a kit. The kit includes the mounting hardware required for installation onto a 35 mm DIN rail. Then, you simply attach up to any five I/O Modules in any desired combination so you can get just the right amount of I/O mix and count. There are three available I/O Modules to choose from: Analog 4-20 mA, Analog 0-10 Vdc, and Digital. Isolation Voltage ∙ 2500 V r.m.s. AO Terminal Voltage Range ∙ 10 Vdc Min. / 31.5 Vdc Max.